Vishu Kanji is a traditional breakfast prepared during Vishu. Hence the name, Vishu Kanji. 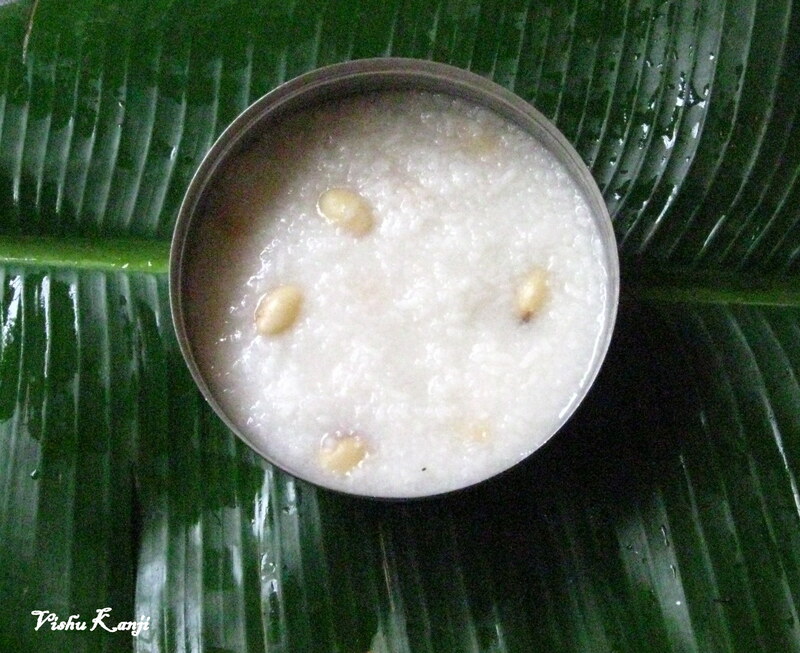 Vishu Kanji is nothing but rice porridge (traditionally, freshly harvested rice is used) cooked with coconut milk, grated coconut, puliavarakka and salt. The most interesting part of Vishu Kanji is in its eating pattern. In fact, the hot and savoury kanji is served in a bowl shaped banana stem or Vazha Pola laced with a banana leaf. And due to the abundance of jack fruits grown during the Vishu season, the spoon used for eating Vishu Kanji is made with a leaf of the jackfruit tree. This makes the dish all the more tasty. But now a days, kanji is eaten with the most easiest way as possible!! This Vishu Kanji recipe is a typical Palakkad / Palghat style – a city in Kerala and there is an another version which is called Vishu katta in parts of Central Kerala. In certain other parts like Vaikom and Trivandrum, they use jaggery and red cow peas or Vanpayar to make the kanji and is a sweetened version of Vishu Kanji. Wash the rice until the water runs clear and keep aside. Soak the puliavarakka overnight in water or atleast 12 hours and in the morning wash in the water. Pressure cook the rice, puliavarakka, grated coconut and salt upto 3 to 4 whistles. Remove from flame and once the pressure leaves, open and mix well. Adjust the consisitency by adding a little hot or warm water. Do neivedhyam or offer to Lord Krishna and serve the Vishu Kanji. You can serve the Vishu kanji with Coconut Chammanthi or Chakka puzhukku (steamed and seasoned jack fruit) or Cherupayar puzhukku and or Pappadam. You can use both the raw rice and parboiled rice together for making kanji. Coconut milk can be used instead of warm water for cooking the kanji. You can either roast the butter beans instead of soaking it overnight and then pressure cook it. You can also use a handful of coconut oil roasted fenugreek seeds along with rice and puliavaraka while pressure cooking the kanji. Thank you Rajani 🙂 Appreciate for sharing your thoughts!! There is something about traditional recipes that sets my heart a flutter. 🙂 Thank you for sharing this traditional recipe! Kanji eaten with a jack fruit leaf spoon makes me feel home sick! Freshly harvested rice from the fields of palakkad is something special!